US Treasury securities are doing something that is worrying a lot of folks, including Fed Chair Janet Yellen: While short-term yields are rising in line with the Fed’s hikes of its target range for the federal funds rate, longer-term yield have done the opposite: they’ve been declining. 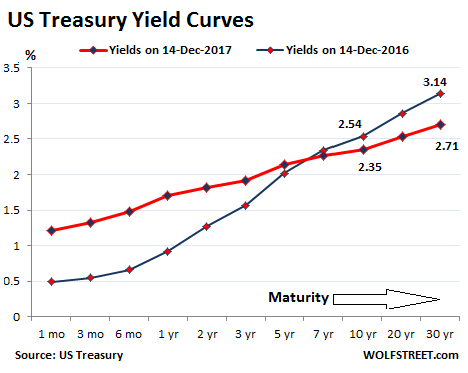 This has flattened the ‘yield curve’ to a level not seen since before the Financial Crisis. This post was published at Wolf Street on Dec 14, 2017. 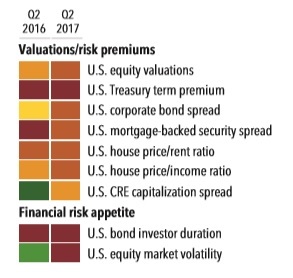 This post was published at Wall Street On Parade on December 14, 2017. He handed over the reins to Greenspan in the summer of ’87 and within months, the new Fed Chairman faced the largest stock market crash since the 1920’s. That trial by fire was invaluable for Greenspan, as he faced a second crisis when the DotCom bubble burst at the turn of the century. After yesterday’s stellar 3Y morning auction, and disappointing 10Y afternoon auction, today’s reopening of the 29-Year, 11-month RZ3 Cusip was right down the middle. The bond stopped at a high yield of 2.804%, stopping through the When Issued 2.808% by 0.4bps, the third consecutive stop through in a row. The high yield was above November’s 2.801% but below October’s 2.870%. After a burst of record high job openings which started in June and eased modestly in August, today’s October JOLTS report – Janet Yellen’s favorite labor market indicator – showed a sharp drop in job openings across most categories now that hurricane distortions have cleared out of the system, with the total number dropping from 6.177MM to 5.996MM, well below the 6.135MM estimate, the biggest monthly drop and the lowest job openings number since May, resulting in an October job opening rate of 3.9% vs 4% in Sept.
After nearly two years of being rangebound between 5.5 and 6 million, the latest drop in job openings despite the alleged improvement in the economy is another inidication that an increasingly greater number of jobs may simply remain unfilled in a labor market where skill shortages and labor imbalances are becoming structural.